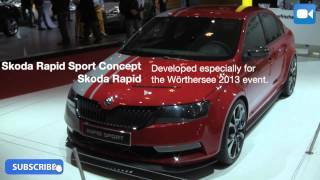 Skoda presented the all-new Skoda Rapid Sport Concept 2013 at the GTI Meeting at Worthersee earlier this month. 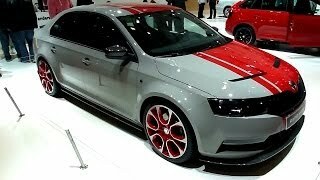 Painted in the metallic colors "Corrida Red" and "Steel Gray", the concept car looks absolutely stunning. The front of the vehicle impresses with spoilers and a powerful air intake in the skirt. Generously dimensioned fenders and massive rocker panels underscore the appearance of the vehicle. Other sporty accents are the rear with a voluminous bumper and two integrated exhaust tailpipes. A circumferential carbon frame completes the bottom section. The sporty layout continues in the interior of the car, for example with a sport-type steering wheel, Recaro seats and illuminated door sills.